The Teen Economists: Are Human Rights Under Fire...Literally? Are Human Rights Under Fire...Literally? A 16-year-old boy was murdered. He never did anything wrong. He never even saw his death coming. The crime was his father's, and he was executed because of association even after his father had been killed. Do you think this is wrong? It's already happened. As technology progresses, humans find more and more ways to use such technology to satisfy their agenda - which usually means someone has to die. And, sadly, that is the case now, as the public has recently found out about a secret government program, that was apparently so top-secret that former White House Press Secretary Gibbs was ordered to deny its existence. This alone is obviously VERY alarming. Any program the government tries so hard to keep a secret obviously spells bad news.What is so bad that they're afraid of their own citizens knowing of its existence? Well, that program is the 'Drone' program. It is a billion-dollar program to create and pilot unmanned, armed drones to use as scouts and, when needed, the middleman who carries out the sentence for the executioner. Someone in Florida could press a button and and blow up a wedding in the middle-east, all in real time. The main aggressors in this are the United States, but also the UK, and the technology has even found its way to China, which already spells disaster. Sadly, there has been no end to the atrocities. Just one example among a sea of them, in the wedding I mentioned earlier, a total of 47 civilians were killed, after they were hit THREE TIMES. The first one hit a group of children travelling ahead of the group. The second strike hit the main party. The third was to make sure there were no survivors. Let's make something clear: the victims were not armed at all. The majority of them were women and children, escorting a bride to her wedding. Perhaps what's even worse is that although the bride-to-be survived the second bomb, which hit the main group, she was killed by the third bomb when trying to flee the area. Imagine how that must feel, about to get married, surrounded by your family and friends, and then, all of a sudden - BOOM! No more wedding, no more friends, no more anything. And you remember that 16-year-old I mentioned earlier? It's not something I just made up. September 30th, 2011, 16-year-old Abdulrahman al-Aulaqi had a bomb dropped on his head. He was a United States citizen, studying to be an engineer. 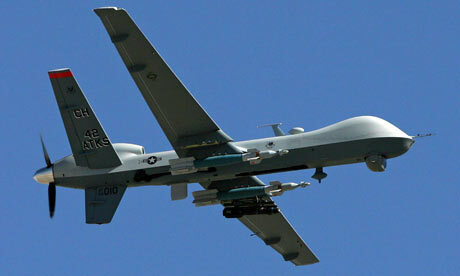 He was killed by a United States Reaper drone! Does this mean the government now has the right to execute their own citizens without judicial process? But, to be fair, his father was known to be an active recruiter for terrorist organizations. So he MUST be guilty by association, right? The sad part of this is that I've barely scratched the surface of it all. There are countless violations of international laws and humans rights I could write here. For instance: did you know that the White house refuses to publish the memos that has the legal justification to killed US citizen without trial? Only this last February has the White House agreed to share this memo with congress. With CONGRESS. Not the public. And while I could rant on and on about these horrible violations of basic human rights and international laws, I'll leave you with this. Congrats ladies and gentlemen, and welcome to planet Earth. This is how things are done here. Any questions? Should Charities Replace the Welfare State?